Beijing’s architecture is a scene of extremes: on one end are Rem Koolhaas’s multibillion-dollar structures; on the other, Dai Haifei’s $964 sleep-pod — which the 24-year-old architect built because he couldn’t even afford to live in the city he helps shape. 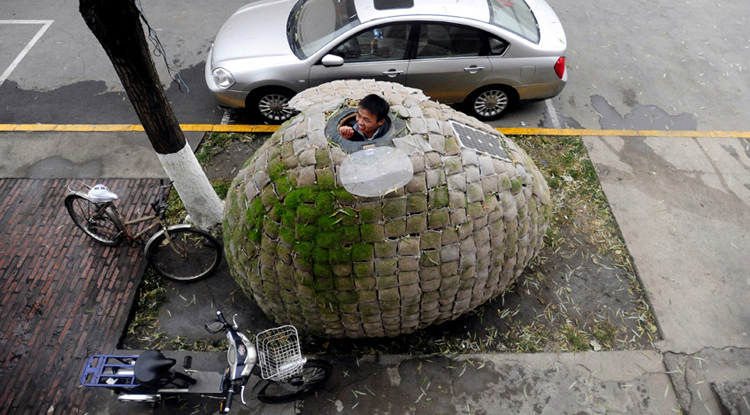 Haifei was inspired to design and build his egg-shaped domicile after seeing a conceptual project called “City’s Egg” at the 2010 Shanghai Biennale Exhibition. “I was impressed by the green-notion of building a house like that, especially in cities like Beijing where rental price for a fresh graduate is a huge burden,” Dai told China Daily. 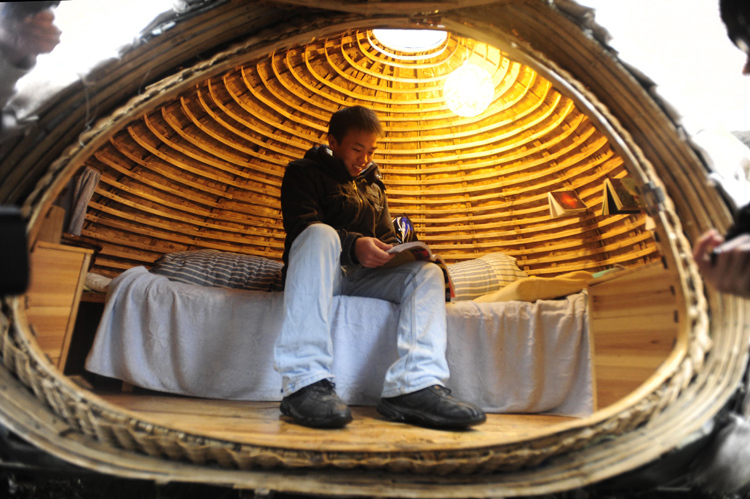 The egg-house’s specifications are, of course, spartan at best: two meters high at its tallest point, built on a bamboo frame, insulated with wood chips, and an exterior made of what looks like cut-up sleeping bags. But what the pod lacks in good looks, it makes up for with hardy sustainable design: grass seeds planted in the cladding will sprout into a green covering over the whole structure, and a solar panel provides power for a lamp and handful of electrical necessities inside. There’s room inside for a bed, water tank, and a small night table — only the bare necessities for Haifei, who told China Daily he crashes in the egg after working until midnight at his architecture office. Let’s hope what he saves on rent will translate into his creating better options for other price-out Beijing residents in the future.